Before investing, consider creating an emergency fund (of up to six months of income in savings) says the Securities and Exchange Commission (SEC), which regulates the investment industry. Though I agree with the SEC in theory, I haven't always acted on this suggestion. A recent study by Prosper Marketplace indicates that my situation may be similar to many Americans, at least in terms of cash holdings. According to its financial wellness study, more than half of survey respondents had less than $5,000 in checking or savings accounts and more than a third had less than $1,000. In addition, nearly half are living paycheck to paycheck. Bank accounts reflect this reality. Though I'm not living paycheck to paycheck, one of my goals this year is to boost the amount of money I hold in a savings account. Putting cash in a savings account is boring; having it there, not so boring. Let me explain why I'm upping my cash holdings and why I haven't taken action sooner. Since getting on my financial feet a few years after college graduation, I've generally had access to funds to cover day-to-day expenses and occasional splurges. But I haven't always felt an urgent need to hold lots of cash. Money should work for me (right?). I have easy access to credit. Rather than establish a healthy emergency fund, I may use my credit cards (or consider getting a home equity line of credit) as a go-to source of money in a pinch. For example, if I need to replace my central heating system, I can charge this expense to my credit card and pay the balance out of regular earnings over the next month or so. I can quickly generate cash from side hustles or expense cuts. I may be able to sell stuff to generate cash or work for a friend who needs help with a project. Alternatively, I may be able to trim my budget to free up cash for large purchases. If I need money in a hurry, I could sell investments. I hold some investments in regular taxable accounts. I can sell those to generate cash. Finally, I get so little from holding cash in a savings account, why bother? I might earn 1.0% interest on cash in a high-yield savings account. That's just $100 in interest each year on $10,000. Surely, that money could be used more efficiently elsewhere. In my case, I might want to apply the money to a college tuition bill or invest in a 401(k). From a math-at-a-glance perspective, holding cash doesn't make sense. Earning 1% interest while you could reduce credit card debt at 10% or invest to capture a 401(k) match and generate 5% returns, for example, doesn't seem to pay off. In the past, holding cash took the proverbial back seat to other financial priorities. Lately, I've reconsidered this approach. The SEC suggestion to build an emergency fund can protect me from a downward financial spiral if my husband or I happen to lose my job or source of income. I'll have money to pay for living expenses searching for a new job or major client. It can also help me deal swiftly and painlessly with emergency expenses like a bill to cover unexpected car repair. Having cash to pay unusual and unexpected expenses can allow me to avoid piling on debt. I can pay for vacations, bicycles, and appliances using money from my savings account. It's easy (usually) to cover monthly bills with a regular paycheck. But those non-monthly bills, like property taxes and homeowner's insurance, may be harder to deal with out of month-to-month cash flow. 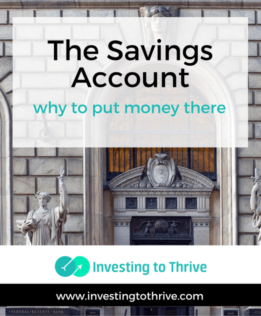 It may make sense to set aside money to hold in a savings account (or a cushion in a checking account) to handle these bills when they come due sporadically throughout the year. Accumulating a sizeable balance in a savings account can allow me to save up for a major purchase, like the down payment on a new home, a new energy-efficient dishwasher, or an epic vacation. I don't have to spend on these things but I have the choice to buy when I'm ready with cash on hand. Save money by paying the cash price. Having cash available lets me get a cash-only price that is significantly discounted from the pay-over-time or pay-with-credit price. For example, last year I was able to get a 25% discount when I paid upfront for my son's overseas mission trip. He still participated in fund-raisers that lowered the cost but because I had the cash to pay early, we saved money on this trip. With cash in the bank, I can avoid selling investments when the market is down — just to generate cash to pay for major purchases. In addition, I'll have the means to take advantage of market dips; I can buy when stock prices are lower than usual. What I've learned is that cash typically doesn't generate high yields sitting in a bank account — even in High Yield Savings Accounts . But cash can allow me to take advantage of discounted pricing, avoid debt, and snag investment bargains. What about you? Do you keep a large emergency fund plus more cash for great opportunities?